Opera Mini is a web browser designed primarily for mobile phones, smartphones and tablets. Now Opera company released new version Opera Mini 7.1 through world wide. 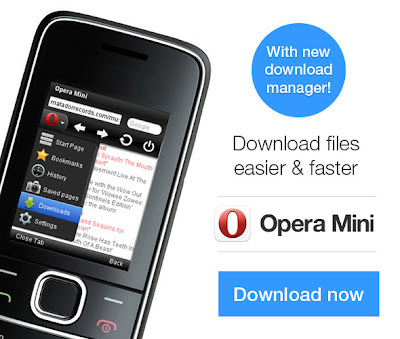 The major update is Opera mini 7.1 comes with new download manager includes lot of useful features. With Opera Mini 7.1 users can pause and resume later their downloads. It now remembers the last location you used for various file types. For example if you save an mp3 file into a folder named "my music" it will use that folder the next time you download an mp3 as well. A new version of Opera Mini is now available for Java and BlackBerry phones. It is not available for Android and iOS devices right now.